These Peanut Butter Banana Muffins with Chocolate Chips are a perfect, lightened up banana muffin. 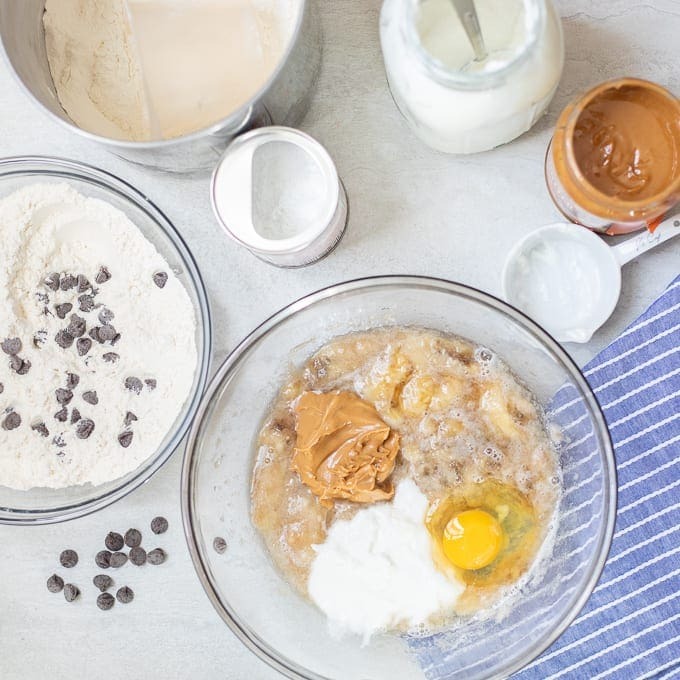 Made with peanut butter, Greek yogurt, bananas, and chocolate chips, these Chocolate Chip Banana Muffins are healthy enough for breakfast, yet decadent enough for dessert. In my house you can NEVER have enough bananas. Seriously, they are one of my most favorite foods. I eat a banana nearly every day and always have them on hand. Once the bananas begin to go brown, let the baking begin! I truly think bananas and peanut butter are a match made in heaven. Add in some chocolate and I find the combination irresistible. That magical combination of peanut butter, bananas, and chocolate are what make these Peanut Butter Chocolate Chip Banana Muffins the best! Not to mention, they have been made with no oil, no refined sugar, Greek yogurt, and whole grain flours–so these Banana Muffins are on the healthier side. Of course you can leave the chocolate chips out for a Peanut Butter Banana Muffin–but let’s be honest, chocolate makes everything a bit better! Grease well or add liners to a muffin tin. In a large mixing bowl, mash the banana well. Add in yogurt, milk, eggs, honey, peanut butter and vanilla and mix well to combine. In a separate bowl, mix together flour, baking soda, baking powder, salt well. Add in chocolate chips and toss in the flour mixture to coat. This helps the chocolate chips not sink to the bottom of the banana muffins. Add the dry ingredients into the wet ingredients and mix until just combined. Pour 1/4 cup muffin batter into prepared muffin pan. Bake for 18-20 minutes or until toothpick inserted in middle comes out clean. These banana muffins will last for 2 days at room temperature. Any longer than 2 days, store these banana muffins in the refrigerator for up to 4 days. You can freeze peanut butter banana muffins for up to 3 months as well. Be sure to use ripe bananas for the sweetest muffins. If you do not like honey, these Banana Muffins can be made with maple syrup. Any style peanut butter will work for these Peanut Butter Banana Muffins. I use natural peanut butter, but shelf stable peanut butter works as well. Be sure to use plain Greek yogurt. Flavored or regular yogurt will change the flavor and texture of these Chocolate Chip Banana Muffins. I love to use whole wheat flour for these Peanut Butter Muffins, but all-purpose flour can be used in it’s place. Preheat oven to 350 degrees. Grease or line muffin tin with silicone liners. In large mixing bowl, mash banana. Add in peanut butter, yogurt, honey, vanilla, egg, vanilla, and milk and mix well. Stir together the flour, salt, baking soda, and baking powder in another small bowl. Add in chocolate chips if using and toss with flour mixture. Mix together the wet and dry ingredients until just combined. Scoop the batter into 12 muffin cups. Bake for 18-20 minutes, or until toothpick comes out clean. Allow muffins to cool for 5 minutes in muffin tin and then remove from muffin pan and cool completely on wire rack. Love these! I could go for a couple with my morning coffee! They would go great with coffee for sure! Oh my goodness do these look good! I wish I had a bunch right now! Chocolate peanut butter anything works for me. I’ll take one baker’s dozen to go. 🙂 Love these muffins, Kristen. A real treat to have peanut butter, chocolate and banana bread in a muffin. Score!!!! Love the peanut butter filling! Wish I had one to get through the afternoon! Wish I could send one your way! Ooh, yum, these sound so delicious! Just my kind of muffin. These look so decadent! Kind of like a healthier donut! Perfect treat, what a yummy muffin! Did some tweeting & yum’d your delicious recipe, stopping by from #FoodieFriDIY – come see us again this week with another amazing combination! Such a wonderful combination of flavors! Love these! They’re great for our busy mornings. Awesome, I love hearing that! Two of my favorites, peanut butter and bananas. Can not go wrong!! They looks delicious! !